1 Universidad Católica de Chile, Magíster en Ciencias Animales, Facultad de Agronomía. 2 Centro de Nutrición Molecular y Enfermedades Crónicas, Facultad de Ciencias Biológicas, Pontificia Universidad Católica de Chile. 3 Programa de Doctorado en Ciencias Veterinarias. Facultad de Ciencias Veterinarias. Universidad Austral de Chile. Key words: a. oleic acid, b. meat c. monounsaturated fatty acids, d. omega 9 e. polyunsaturated fatty acids. Modern eating habits have changed towards a diet high in saturated fatty acids and unbalanced in polyunsaturated fatty acids (PUFA), with a high omega 6/omega 3 (ω6/ω3) ratio, which should be <5 (Rondelly et al., 2004). The ratio is estimated between 10 and 15 for the current western diet and between 8.7 and 10.7 for the Chilean diet (Leighton et al., 2011). Coupled with a decrease in antioxidant intake, modern diets are believed to cause the high prevalence of diet-related diseases, such as obesity, diabetes type 2, hypertension, coronary artery disease, arthritis and inflammatory and autoimmune disorders (Simopoulos, 2002, Ajuyah et al., 2003, Calder, 2006, Schmitz and Ecker, 2008, Leighton et al., 2011). In recent years, consumption of chicken has increased (Buzby and Farah, 2006) due to its nutritional characteristics, such as its high protein (around 20 g/100 g raw meat without skin), low fat intake (around 5 g/100 g raw meat without skin), high content in essential fatty acids and fat soluble vitamins, coupled with a favorable saturated and unsaturated fatty acid ratio, considerations taken into account by consumers (Wood et al., 2003, cited by Woods and Fearon, 2009). Consumption of oleic acid (18:1, ω9) reduce levels of Her-2/neu oncogene associated with aggressive mammary tumors (Menendez et al., 2005) and is important for the proper development of myelinization of the nervous system in children (Uauy Dagach and Olivares, 2007), as well as having bactericidal properties (Schlesinger and Uauy, 1991). It is known that the fatty acid composition of animal products is the result not only of biosynthesis in tissue, but also the fatty acid composition of ingested lipids (Mourot and Hermier, 2001), being stronger in monogastrics, where stored lipids in adipose tissue not only reflect ingested lipids (Chilliard et al., 2008), but also can indirectly affect fatty acid composition through the modulation of lipogenic enzyme expression (Missotten et al., 2009). This knowledge has led to an increase in demand for healthy food products, encouraging the manipulation of both the quantity and composition of lipids in chicken meat (Wood et al., 2003, cited by Woods and Fearon, 2009, Villaverde et al., 2006, cited by Ferrini et al., 2010), that is, increasing the contribution of ω3 polyunsaturated fatty acids and monounsaturated fatty acids to diets (Andersson et al., 2002). Due to the high cost of fish products rich in ω3 polyunsaturated fatty acids extensively used in animal feed, other sources have been evaluated, such as α-linolenic acid, a precursor of ω3 polyunsaturated fatty acids > 20 carbon (Lagarde, 2008). One way to do this is to feed birds with oils and seeds rich in α-linolenic acid, a ω3 fatty acid with 18 carbons, a precursor of long-chain fatty acids, such as eicosapentaenoic acid (EPA), docosapentaenoic acid (DPA), and docosahexaenoic acid (DHA), fatty acids, such as canola oil (Boletín Ciencia Vino y Salud, 2002, Kouba and Mourot, 2011). There is an inverse relationship between the number of unsaturations of a fatty acid and their half-life. Thus, the higher the amount of unsaturated fatty acid present, the greater the risk of oxidation, causing rancidity and color deterioration (Eder et al., 2005). Canola oil has a high content of α-linolenic acid, which is susceptible to oxidation, although less susceptible than fish oil and linseed oil (Mourot and Hermier, 2001). An alternative to meat with low levels of lipid oxidation is oils rich in monounsaturated fatty acids (MUFA) (Rey et al., 1997, Hsiang-Fen et al., 2002), such as canola oil. Poultry fat is widely used in poultry diets, but little is known about the effects of canola oil on meat, fat and plasma fatty acid profiles. The aim of this study is to evaluate the possibility of modifying the fatty acid composition in poultry fat, meat and plasma, through the addition of various proportions of canola oil to the diet. A total of 128 one-day-old male and female Cobb broiler chicks received various diets until day 45 of the study and were then sacrificed. A completely randomized design was used, the animals being randomly assigned to 4 groups of 32 chicks. Each group of 32 chicks was divided into 4 subgroups of 8 chicks per cage. The 4 experimental diets, in fresh base were 15% oil (canola oil or corn oil, or both) as follows: Diet 1: 0% canola oil and 15% corn oil (control diet). Diet 2: 5% canola oil plus 10% corn oil. Diet 3: 10% canola oil plus 5% corn oil. Diet 4: 15% canola oil and 0% corn oil. The oils were stored in a cold chamber between 0 - 5 C.
The consumption period for each diet and animal group was defined from the previously known broiler chicken growth curve. Chickens assigned to experimental diets consumed the starter diet for 14 days, followed by a grower diet for another 14 days, and then by a finisher diet for the last 17 days. The starter diet, a commercial diet, was the same for the four groups and it was free of added oil. The grower and finisher diets (see Tables I and II) were based on soybean bran (Glycine híspida), corn grain (Zea mais) and tricalcium phosphate, which included a 15% oil. The formulations were based on the minimum requirements and contribution of the diet according to the age of the bird (NRC, 1996). The energy/protein ratio (E/P) of the experimental diets had approximately 20% protein, a low value for proteins considering the amount of energy provided. To improve the E/P ratio, the content of soybean bran in the diets was increased 35% taking into account the detrimental effect of the antitriptic factors in soybean bran on birds growth rate, aiming at an optimal diet to study the action of canola oil on the monounsaturated fatty acid content in broiler chicken. A biochemical analysis was performed on leg and breast meat samples, abdominal and subcutaneous fat samples and plasma samples of broilers. Food samples (starter diet, soybean bran and corn grain) and the vegetable oils were analyzed biochemically and the oxidative stability of the oils was measured and compared to that of olive and sunflower oils, which are also used in experimental diets. Broiler measurements: food consumption (g MS/cage/45 days), water consumption (ml of water/cage/45 days), food conversion, final live weight (g/cage/42 days), antemortem weight (g/chicken) and carcass weight (g/carcass). Broilers were sacrificed at day 45 using the manual neck breaking technique. Meat samples (leg and breast) free of subcutaneous fat and skin, fat samples (abdominal and subcutaneous) and plasma samples were obtained. Meat samples free of subcutaneous fat were deboned before uninterrupted homogenization for 30 seconds with a Moulinex meat chopper. The samples were stored in hermetically sealed bags and kept at -20°C until analysis (within 2 months). Fat samples were obtained from the abdominal and subcutaneous zones and stored in hermetically sealed jars at -20°C until analysis. Plasma was obtained from chicken blood collected from a bird pool belonging to each subgroup after 12 hours fast. The total sample was obtained through wing vein puncture, collected in venoject tubes with anticoagulant (heparin) and kept on ice. Plasma was separated from erythrocytes by centrifugation at 14,000 rpm for 60 seconds at room temperature, using a Hettich centrifuge. Free fatty acid, expressed as grams per 100 grams of oleic acid, was determined using official Chilean procedural protocol (INN) NCh 95-81, a method to determine free-acidity, acidity index and mineral index in fat of animal and vegetable origin. The peroxide value (milliequivalents active O2/Kg oil or fat) was determined according to official Chilean procedural protocol (INN) NCh 105:80 for animal and vegetable fats. Anisidine was determined according to the procedural protocols of ISO draft International Standards 6885. Determination of TOTOX index: 2 x ("peroxide index) + 1 x (Anisidine value). The iodine value (absorbed iodine grams per 100 g of sample) was determined according to official Chilean procedural protocols (INN) NCh 93-80 for animal and vegetable fat. Total fat and mositure were determined according to official Chilean procedural protocol (INN) NCh 1370/III of 77. Fatty acids composition was determinated through by gas chromatography as follows: lipids were extracted using chloroform/methanol (2:1, vol:vol) containing 0.01% BHT (Bligh and Dyer, 1959). Total fatty acids were transesterified with methanolic-HCl (1 N) overnight at room temperature and extracted with n-hexane. After extraction, the derivate was injected into a gas chromatographer. The methyl esters were quantified by gas-liquid chromatography (GC 6000 Vega Serie 2, Carlo Erba Instruments) employing a capillary column (50 m x 0.32 mm x 0.25 um, SGE BPX-70) with hydrogen as carrier gas and a temperature program of 5°/min from 110 to 230°C. Detector temperature: 280°C, and injector temperature: 260°C. Standards employing a commercial kit (Nu-Chek Perp, Inc.). Results are expressed in % of methyl esters (Cuevas et al., 2000). Volumes for extraction: plasma (200 ul), meats (150 g), fats (15 g), oil (50 ul) and food (50 g). Food and water consumption, weight gain, food conversion efficiency and productive yield were statistically analyzed with the Tukey multiple comparison test. The oxidation level, fatty acid, total fat and moisture measurements were analyzed with the Tukey multiple comparison test, Pearson correlation and student's t-distribution for independent means. There was a non-significant increase in food consumption, water consumption, food conversion, final live weight, antemortem live weight and carcass weight with higher percentages of canola oil in the diet. There were lower levels of oxidation with higher levels of canola oil (see Table II) canola oil had lower levels of oxidation than corn oil. The fatty acid composition of the ingredients of the grower and finisher diets is shown in Table III. Canola oil showed higher percentages of oleic acid and α-linolenic and a lower ω6/ ω3 ratio (3.07) than corn oil (32.09). Soybean bran had higher percentages of palmitic acid, stearic acid, linoleic acid and α-linolenic acid than corn grain, which had 30.47% oleic acid, a value higher than in soybean bran (20.02%). Corn and soybean bran had similar levels of linoleic acid (ω6) (52.0-55.0%). The ω6/ω3 ratio was lower in soybean bran (16.49) than in corn grain (24.14). 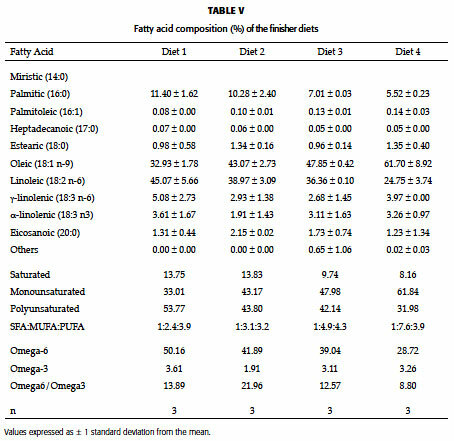 Table IV shows the fatty acid composition of the commercial starter and grower diets. 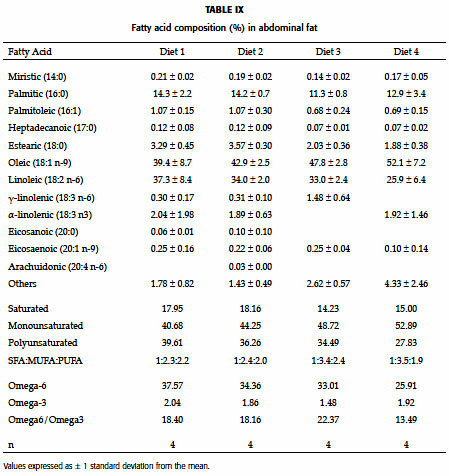 The fatty acid composition of the finisher diets is shown in Table V.
Leg meat (see Table VI) and breast meat (see Table VII) of the birds fed with the diet containing 15.0% of canola oil presented the lowest percentage of saturated fatty acids and ω6 PUFA, and the highest percentages of MUFA and ω3 PUFA (P<0.001), resulting in a lower ω6/ω3 ratio than the other diets. 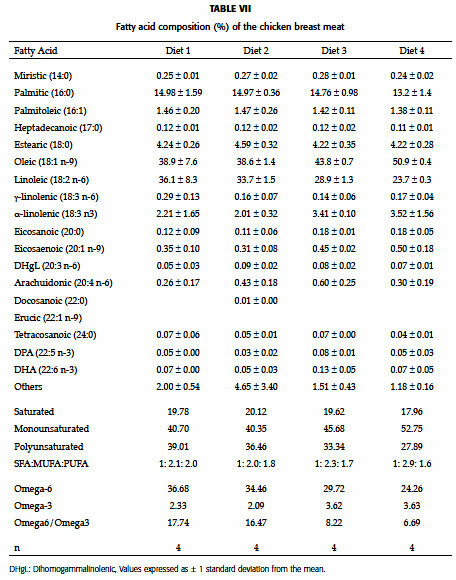 Total fat and moisture (see Table VIII) did not show significant variations according to the content of canola oil in the diet. The fat content was significantly higher in legs than in breasts, while the humidity was higher in breasts (p<0.05). 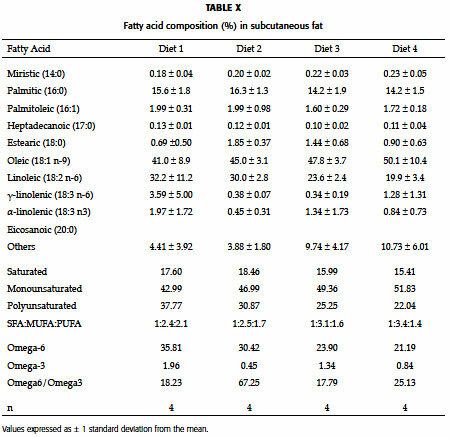 The fatty acid composition of abdominal fat (see Table IX) and subcutaneous fat (see Table X) showed a lack of long-chain fatty acids (longer than 20 carbon atoms). An inverse relationship was found between oleic acid (MUFA) and linoleic acid (ω6 PUFA) (p<0.001) with higher percentages of canola oil in the diet (chicken fed with control diet had the lowest percentage of oleic acid of the experimental diets). EPA, DPA and DHA acids were not detected in abdominal and subcutaneous fat in contrast to detectable levels in plasma and muscle tissue. There was the same tendency for higher levels of oeleic acid in plasma (Table XI), as well as the same tendency for lower levels of linoleic acid (ω6 PUFA) with higher percentages of canola oil in the diet (p<0.001). 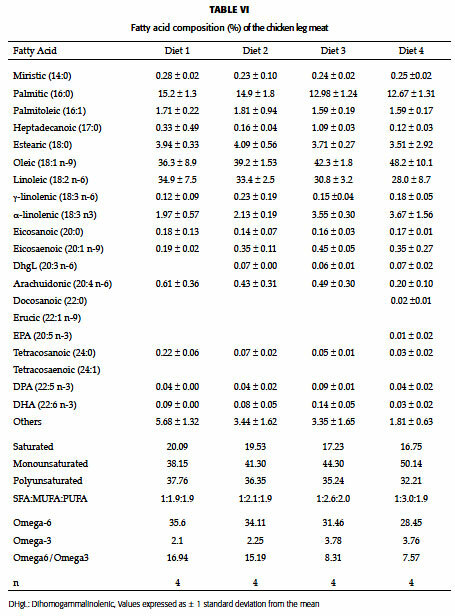 Levels of α-linolenic, EPA, DPA and DHA acids in plasma were also higher (an increase of ω3 PUFA, which for DHA is more than 100% and even higher for the others) with higher percentages of canola oil in the diet. Notably, this tendency was not apparent in leg and breast samples where only α-linolenic acid showed an increase that correlated to dietary canola oil. The lowest ω6/ω3 ratio (4.44) was found in plasma of the birds fed with diet 4, the richest in canola oil. The fatty acid composition in plasma showed the presence of long-chain fatty acids (longer than 20 carbon atoms), but this was not observed in fat tissue. Canola is the name given to a cultivar bred naturally from rapeseed in Canada that contains less than 2% of erucic acid (C22:1, ω9) in relation to the total fatty acid. It also contains less than 30 umoles of glucosinolates per gram of free oil on a dry seed matter basis (Leeson & Summers, 2001, cited by Baião and Lara, 2005). Human consumption of canola depends mostly on availability and price, in competition with soybean oil and sunflower oil, which are imported from other countries, such as Argentina and Bolivia (Leighton et al., 2011). In the present assay, the lower levels of oxidation reported for canola oil can be explained by the lower number of unsaturations (Rey et al., 1997, Hsiang-Fen et al., 2002), because of its higher content of MUFA (Eder et al., 2005) than PUFA, in relation to the other tested oils. 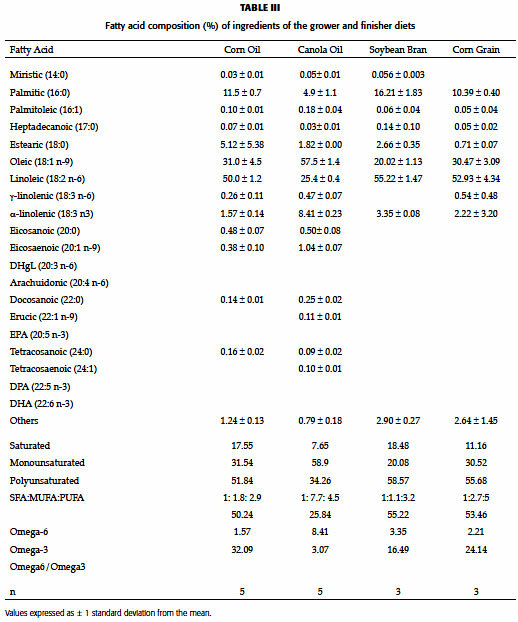 In this study, higher levels of MUFA of the oleic acid type, and lower levels of PUFA ω6 (linoleic acid) was observed with higher percentages of canola oil in the diets (p<0.01). The analysis of fatty acids in meat of either legs or breast showed that it is possible to modify the fatty acid profile of the meat, increasing the MUFA content of the oleic acid type and decreasing the PUFA content of the linoleic acid type (p<0.01), with a slight increase in the content of α-linolenic acid (p<0.05) in the meat, by increasing the canola oil content in the diet. Aghdam Shahryar et al., 2010, reported that the use of canola oil by up to 6% increased the oleic acid content, as well as total PUFA (mainly DPA and DHA acids), but decreased linolenic acid content (p<0.001), which differs from the results of the present study, which found an increase in linolenic acid content, but not in total PUFA content. As well, Salamatdoustnobar et al., 2011, working with canola oil in Iranian native turkeys, reported a decrease in monounsaturated fatty acids and an increase in polyunsaturated fatty acids. Soler et al., 1998, carried out a study in pigs using diets with different canola oil percentages (0.5 and10%), plus supplementation with vitamin E, and found that canola oil increased the MUFA levels but decreased saturated fatty acids in the liver. In broilers fed with rapeseed oil, long chain ω3 PUFA levels decreased significantly while MUFA levels increased in direct correlation with the higher content of oleic acid in the diet (López-Ferrer et al., 1999a). This observation suggests that a higher amount of canola oil in the diet could have an inversely proportional effect on the saturated fatty acids of the carcass, causing an increase of MUFA especially of oleic acid (p<0.05) due to the type of food used, and the fact that birds store fat mainly as oleic acid (Scott, 1982). As well, Zannini et al., 2008 reported that canola oil diet supplementation in broilers resulted in a decrease in the saturated fatty acid content in breast meat, as well as in the MUFA content in thigh, breast, liver, and gizzard, results that differ from our results. In the case of PUFA, especially linoleic acid, a decrease (p<0.05) was interpreted as inhibition of the desaturation of ω6 fatty acids, due to decreased of corn oil contribution and increased canola oil in the diets. We observed that the ω6/ω3 ratio decreased by half (p<0.05) with an increased percentage of canola oil in the diet. This could be the result of the significant decrease of linoleic acid, together with the non-significant increase of α-linolenic acid. Pietras et al., 2000, carried out a study in 4-7 week-old broilers with grower diets, and found that diets containing 15% rapeseed or 6% rapeseed oil significantly increased the α-linolenic acid content in the meat. In the present study, even though the experimental diets did not contribute with long-chain fatty acids, their presence was observed in the fatty acid profile of legs and breasts, which suggests hepatic elongation as a result of the high fat diet. In poultry, de novo lipogenesis occurs in the liver from dietary carbohydrates, reactions catalyzed by both, glucose-6-phosphate dehydrogenase and malic enzyme that provide the reduced equivalents required for de novo synthesis (Alvarez et al, 2000). Subsequently, triglycerides are hydrolyzed into glycerol and fatty acids and transported to adipose tissue in chylomicrons and very low density lipoprotein (Mourot and Hermier 2001) deposited in the fatty organ or oxidized to obtain energy (Bensadoun, 1991, cited by Ferrini et al., 2010). The conversion of canola oil enriched with linoleic and α-linolenic acids into EPA and DHA has been reported by Sealls et al., 2008. Similarly, Azcona et al., 2008 studied the effect of the incorporation of omega 3 and omega 9 fatty acids on meat quality in Argentinian "Campero" chicken, and reported an improvement in the contents of oleic, α-linolenic, EPA, DPA and DHA fatty acids, coupled with a drastic reduction in the omega 6/omega 3 ratio. 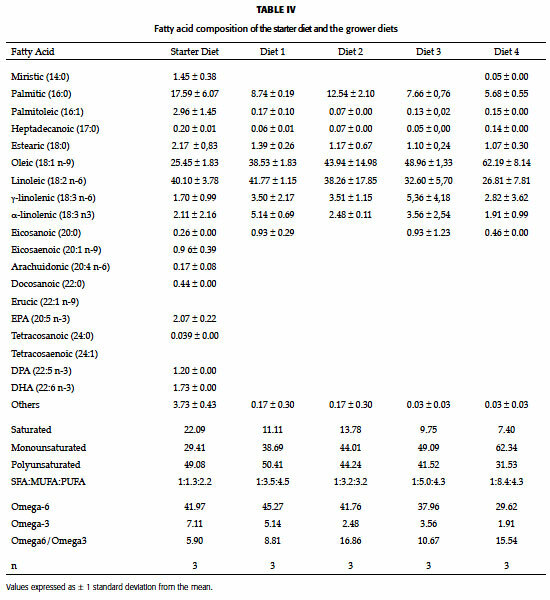 However, in this assay, the α-linolenic acid content in the canola oil allowed to increase the content of ω3 fatty acids in meat (p<0.05), with small increases of the EPA, DPA or DHA content, since the conversion of α-linolenic acid to EPA, DPA and especially to DHA, is restricted (Burdge and Calder, 2005, Barcelo-Coblijn and Murphy, 2009). Long-chain fatty acids are stored at muscle cell level and are used as energy source. It is known that diets rich in oleic acid, like canola oil (opposed to diets high in PUFA) favor the deposition of stearic acid in fatty deposits other than abdominal, breast or leg fat (Crespo and Esteve-García, 2002, cited by Woods and Fearon, 2009). Lopez-Ferrer et al., 1999b, measured the fatty acid composition in abdominal and leg fat following the use of different diets enriched with 8% vegetable oil. Their results agree with those obtained in this study, since they found that the amount of ω3 fatty acids in legs was higher than in abdominal fat. 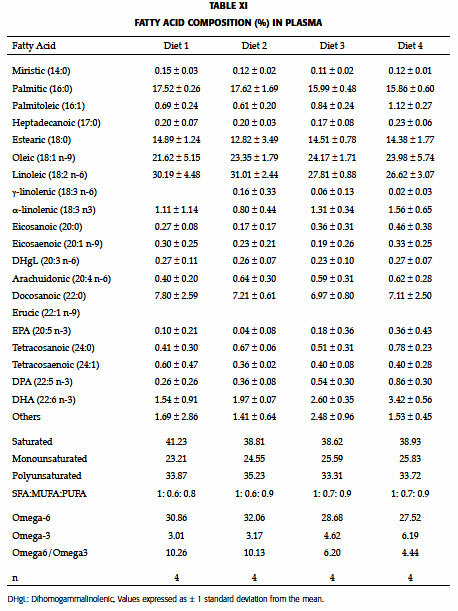 Legs from chickens fed diets high in corn oil showed the highest content of ω6, with a predominance of arachidonic acid (20:4, ω6) due to the high amounts of linoleic acid in the diet. A low content of arachidonic acid was found in samples from experimental diets with a higher content of canola oil and therefore of ω3 fatty acids, confirming the known competition between ω6 and ω3 precursors, linoleic acid and α-linolenic acid, in long-chain derivative synthesis. It is known that birds have high levels of desaturase activity. Competition exists between the essential fatty acids ω6 and ω3 for the delta-6 desaturase enzyme, which is required for elongation of fatty acid of 18 carbons, as linoleic and α-linolenic acid to EPA (C20:5, ω3) and DHA (C22:6, ω3) (Fritsche et al., 1991). These authors fed canola oil (70 g/Kg) with increasing amounts of α-linolenic acid in chicken diets (5.5 g/Kg). The delta-6 desaturase enzyme is required for the conversion of linoleic acid (ω6) to arachidonic acid, as well as α-linolenic acid (ω3) to eicosapentaenoic and docosahexaenoic acids and statistically significant increases were detected by these authors Through substrate competition the presence of high amounts of linoleic acid present in corn, sunflower and soybean oils can inhibit conversion of α-linolenic acid to eicosapentaenoic acid (Simopoulos, 2000). The content and composition of intramuscular fat are both important quality characteristics (Fernandez et al., 1999). Total fat values in chicken breasts (between 1.67 and 1.91%) were significantly lower (p<0.01) than in legs (between 3.95 and 8.07%). In a comparative study of total fat in several species (INTA, 2001) it was found that apart from chicken breast and beef rump steak, which are typical fat free cuts, chicken legs showed high values (6.06%). Crespo and Esteve-García 2001, using diets with four types of fats (tallow and olive, sunflower and linseed oil) at 6 or 10% of fat inclusion in the diet of broiler chicken, reported total fat contents of between 7.7mg/g and 8.1mg/g (with 6% oil) and 11.6mg/g and 12.1mg/g (with 10% oil in the diet). However, by supplementing the diets with tallow, total fat content was increased by over 90mg/g. The inclusion of canola oil in the diet decreased the content of total lipids in legs, particularly in diets also containing some percentage of corn oil, since this oil is high in PUFA, and is effective in reducing abdominal fat and separable fat, but not that in meat (Zanini et al., 2003). In female broilers fed with different types of fat (10% of tallow animal fat, olive oil, sunflower oil or linseed oil) Crespo and Esteve-García, 2002a, determined that PUFA reduced abdominal fat and separable fat deposits, which represent 30% of total lipids. However, there was no effect on the rest of body fat deposits (skin, visceral tissue, feathers, bones and remaining fat in the carcass), which represent 75% of total lipids (Nir et al., 1988). These authors also found that abdominal fat and leg cholesterol decreased more in diets containing sunflower or linseed oil (high in PUFA) than those with tallow animal fat (saturated fatty acids) or olive oil (high in MUFA). Crespo and Esteve-García, 2002a, also studied female broilers fed with diets containing 10.0% linseed oil (high in PUFA) between days 28 and 48, and found that they had less abdominal fat than the ones fed with SFA or MUFA. These authors (Crespo and Esteve-García, 2002b) believe this effect might be caused by a higher lipid oxidation due to a greater endogenous lipogenesis (as another mechanism for driving energy away), thus contributing to reduce fat deposits. With regards to the plasma fatty acid profile, the same trends were found of increasing MUFA content of the oleic acid type and decreasing PUFA content of the linoleic acid type (p<0.01) with higher canola oil and lower corn contents in the diets. However, these trends were less evident as in muscle and fat, probably due to the lower fat content in the plasma. However, it is worth highlighting the presence of long-chain polyunsaturated fatty acids in plasma, EPA and DHA in our measurements even though the experimental diets did not provide them. The ω6/ ω3 ratios in thigh, breast, fat and plasma were lower in broiler chickens fed with diet 4 (15% canola) than in chickens fed with other experimental diets, leading to lower ω6/ω3 ratios, approaching the recommended value <5. Canola oil incorporated in the diet increased the content of oleic acid (ω9) and α-linolenic acid (ω3) and decreased the content of linoleic acid (ω6) in broiler chicken tissues. The birds consuming diets high in canola oil had lower 006/ ω3 ratios, to values of less than 5. Finally, it should be stressed that dietary fatty acid composition is best represented by fat tissue rather than muscle tissue fatty acid content. We thank the Molecular Nutrition Laboratory at the Faculty of Biological Sciences, Pontificia Universidad Católica de Chile, and the Ciencia Vino Salud Project (PUC-PBMEC 2003), for their support. We are extremely grateful to Pablo Strobel, Fernando García and Fernando Bas for their direct and wise collaboration in this study. We also thank the Zootechnics Department of Pontificia Universidad Católica de Chile. Received: April 14, 2011. In revised form: April 17, 2012. Accepted: April 19, 2012. *Corresponding author: María Asunción Gallardo Paffetti. Casilla 567. Phone-fax: (63)221548. e-mail: mugallar@gmail.com.